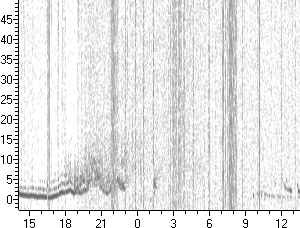 The plot above is taken of the Inskip chirp sounder, 80km from my QTH. 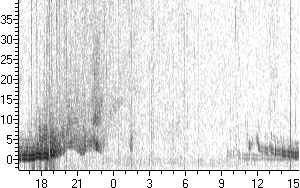 Frequency used about 5200kHz. The horizontal axis is time (UTC) and the vertical axis is delay (ms). Note that the delay is not relative to anything in particular as my system is not fully calibrated yet. The plot runs from about 1600 on 7-9-2002 to 1530 on 8-9-2002. It was done at the time of a huge Coronal Mass Ejection (CME) so the ionosphere is very disturbed. Summary: A solar wind shock wave swept past Earth on Sept. 7th at approximately 1630 UT (12:30 EDT). The interplanetary magnetic field turned sharply south when the wave arrived, which triggered a strong (G3-class) geomagnetic storm. Sky watchers in northern Europe, Canada, and most northern US states spotted auroras. See pictures and video of Aurora caused by this event here. Between 1600 and 1900 there are strong returns from the E layer. The reason for the double return is unclear and may be a problem with my equipment (currently thought to have been due to inadvertently leaving a notch filter switched on). The blurring above the two distinct lines is due to the disturbed state of the ionosphere. At about 1930 the E layer disappears and the F layer takes over. At 2230 there is a high amount of "spread F" (the blur between 3ms and 30ms). At about 0100 Inskip fades out. It reappears at 0930. At 1100 another return appears and converges on the lower trace - no idea what that is at the moment. The plot above was done by Terry G4GJR over the same period. This is very similar and also shows the same odd converging effect towards the end of the period. In Terry's case, the multiple reflections at the beginning are more likely to be real effects due to multiple skips.